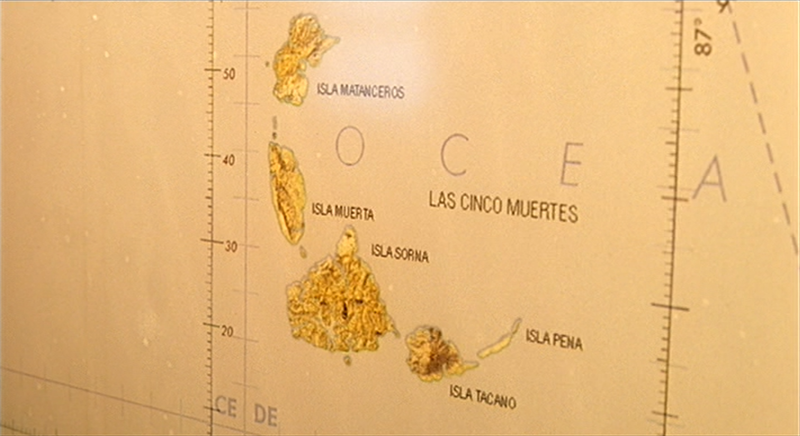 Numerous maps of Isla Sorna exist, both in-film props and real world publicity items. One would therefore think that it would be a simple thing to create a map corresponding to the films’ events. However, none of the maps work together, and topography varies from one map to another. It seems the production team for the films did not have any sort of concrete map or topography from which they were working from. That left JPL’s Map Team with a dilemma. Which of these many maps should be used as the de facto topography for our map? Should we rule out every other map or attempt to merge all the maps together? Should one map be considered more likely to be “accurate” than all the others? After a lot of deliberation it was agreed that the map seen in The Lost World: Jurassic Park during Kelly’s wandering of the trailers (below) was the most accurate for our purposes. The topography is clear, the map is given a central focus in the film (even if only for a few seconds), and within the film universe itself it appears to be a detailed map of the variety you would find pinned in a government building. So our topography was established; now we had to determine the size of the island. This was done fairly easily. Costa Rica appears on this map as well, and sizing it appropriately allowed us to determine the size of Sorna. The result; approximately 21 x 20 miles. The island was now complete. We created a large topographical map of the entire Las Cinco Muertes island chain and created a map scale from there (at our scale; 116 pixels per mile). Work on actual locations could now finally begin. Determining the specific locations for various events was a complicated task. There was no existing map to draw reference from, and so any clue as to the location of, say, the high hide was hidden within the film. We were required to look at dialogue exchange and the physical features of the island as a primary source. In situations where that did not provide enough of a framework, such as the exact location of the trailers, logic and deductive reasoning were required in order to eliminate other potential locations. The most sound method was to refer to specific dialogue or plot elements for clues, then fall back on features of the landscape, and then finally determine any other elements to come to a conclusion. Going over each and every point of reference in this article would be tedious, to say the least. However, you can get an idea for the process if we look at the location of the Operations Center (sometimes referred to as the worker’s village) and why we put it where we did. Let’s look at the evidence. 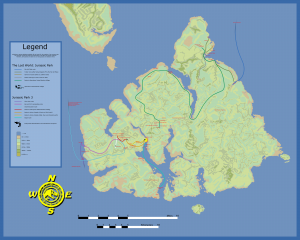 The location of the village was stated to be in the center of the island. We also have Roland’s comment to Ian and Ajay during the night (after Roland returns from finding Dater’s body, and just before the two rexes attack) that “the Operation’s Building is right down in there, about a mile and a half from the base of these cliffs.” This gives us three frames of reference; the village is in the middle of the island, is at a low elevation change (they have to go down cliffs to reach it), and is approximately a mile and a half away from the cliff side or ridge (this also gives us a clue as to where the temporary camp is located, but we will come to that later). 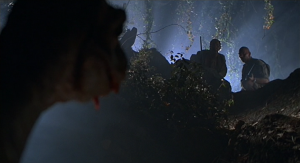 A fourth piece of evidence comes in the form of the Velociraptors, which seem to be stationed in droves around the village. Combine that with Ludlow’s comment about the group having to worry about Velociraptors and we are led to the conclusion that the village lies near the raptor territory as seen on Hammond’s computer near the beginning of the film. Now that all of this evidence is compiled we can turn to the map, looking specifically at the area in the center of the island near the Velociraptors. From there we look for a lowland area with a positive change in elevation and see if we can put the village about 1.5 miles from that cliff side. Working with the map we are able to put in place an “approximate location.” It is important to note that sometimes locations would be changed as other factors became apparent, or new information was brought to light. The location of the game trail, for example, changed considerably during our analysis from the middle of the island down to the south to then up to the north. Based upon film evidence and working with the map we believe that the events unfolded as such. The Mar Del Plata, the boat hired by Hammond’s team, approaches the island from the north. It heads south along the eastern coast of Sorna before landing in a lagoon. After unloading the vehicles Hammond’s team heads north, following a dirt road toward the location where (presumably) Sarah should be located. They park the trailers near a set of cliffs in the northern-most area of the island and power on their GPS units, heading back south to rendezvous with Sarah. After finding her and heading back north towards camp they discover that Kelly has stowed aboard the trailers (it is by now getting close to “dinner time”). Within minutes they watch Ludlow’s team (“the hunters”) as they approach from the north and head along the eastern coast of Sorna, soon landing a few miles south of the trailers on a game trail. Hammond’s team jumps in their Jeeps to follow the helicopters and survey the hunters. Ludlow’s Team approaching from the north. 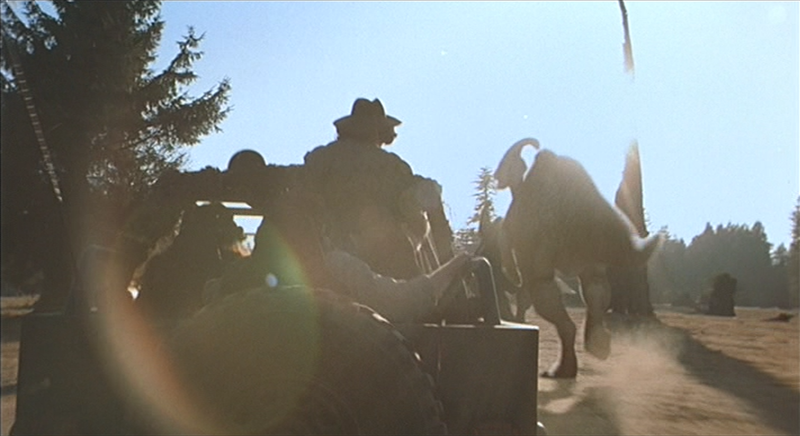 The hunters travel westward along the game trail, into the setting sun. 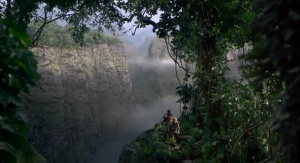 Roland and Ajay, during a break, discover a set of Tyrannosaurus footprints disappearing into the jungle toward the southwest. The rest of the hunter team continues their work while Roland and Ajay track the footprints back to the Rex Nest, about five miles to the southwest. They return with the infant by nightfall. The hunters, heeding Roland’s earlier advice, make camp off the game trail (unbeknownst to them just a mile or two from the trailers). Roland and Ajay set up their hunting blind nearby. Roland and the rest of the hunters drive into the setting sun during the roundup scene. A view of the coast from Hammond’s team’s scouting location, showing the ocean behind the game trail. With light filtering in through the trees Roland and Ajayhave reach the rex nest before nightfall. By the time Nick and Sarah begin their sabotage of the hunter camp “mommy and daddy” have already discovered that their infant is missing and are heading north while Ian, Kelly, and Eddie head back to the trailers. Eddie begins setting up the high hide. Eventually Roland and the other hunters realize they have company on the island and head north along the dirt road, hoping to find the other humans. Sarah and Nick work on setting the infant rex’s leg as the adults get closer, passing under the high hide and likely passing the hunters as well (who hide, of course). Eventually they reach the trailers and, after getting their infant back, push the trailers over the cliff. Eddie leaves Kelly in the high hide and takes the Jeep to help; not long afterwords the hunters reach Kelly and bring her along with them (likely thinking her safer with a group of guys holding big guns). Soon the adults return to kill Eddie, then leave again. The hunters finally reach the trailer site, just in time to help the remains of Hammond’s team to safety. All the survivors together then regroup back at the destroyed hunter camp. The survivors return to the hunter camp to regroup, salvage equipment, discuss their options, and just generally argue. After arguing and much deliberation it is agreed that the survivors will travel to the Operations Center in the workers village, Ludlow citing this trip to take “a day’s walk, maybe more.” They head south before dawn breaks, eventually passing by the coast in the wee hours of the morning. They are soon set upon by a shower which passes quickly. 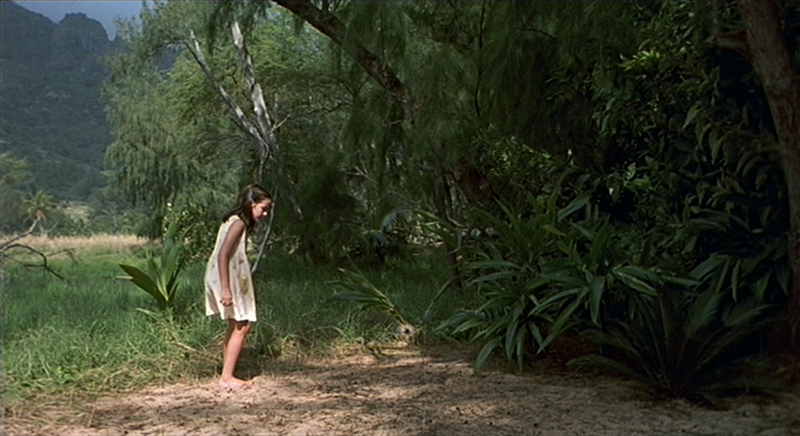 Sometime in the second half of the trek they are forced to walk north around a set of intertwining mountain ranges, doubling their travel time (where otherwise they would have headed due west and made the trip in about 10 hours), and pass near the location of Cathy’s beach (the beach where Cathy, the young girl, was attacked by Compsognathus at the beginning of the film). 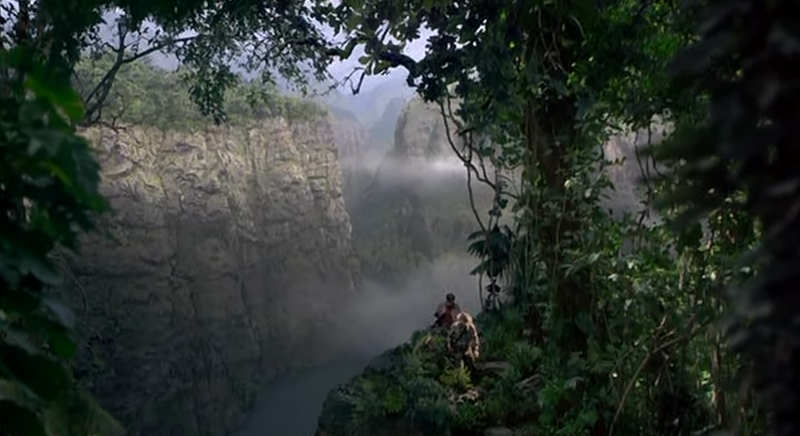 This is indicated by identical mountain ranges in the backgrounds of both shots. Here they hear the distant roar of a Tyrannosaurus, likely one of the adults following the scent of blood on Sarah’s jacket. 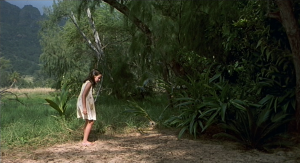 Cathy Bowman as she encounters the first Compsognathus. Note the mountain range in the top left corner of the image. The same mountain range as above, behind the survivors, as they continue their trek to the Operations Center. In the late afternoon Roland stops the group just a few miles short of the village, checking on Sarah’s health. Dieter takes the time to relieve himself but is frightened by a compy and takes a tumble, injuring himself. He is soon killed a distance away from the rest of the survivors, who start moving again. About 15 minutes later they realize Dieter is missing. Roland tells the rest of the group to continue on, as they are “ten minutes” away from the ridge where they will take a few hours rest. He and a small group of hunters head back to find Dieter. Roland and the others eventually rendezvous with the rest of the survivors at the ridge some time in the night. Roland implies he had taken a detour close to the village before returning back (“I’ve seen it”) and comments that in one hour they will make the final stretch to the village, “about a mile and a half from the base of [the] cliffs.” At this point the adult rexes have caught up to the survivors and attack them, actually pushing everyone toward the village. The survivors of the rex attack wade through raptor territory in the long grass. Few survive. Ian, Nick, Sarah, and Kelly make it through the grass and fall down a short incline to come level with the village. Nick runs ahead to the Operations Center to call for help, eventually being joined by the others after the raptors attack in the village. They all get flown to safety. Back at the ridge Roland has captured the male rex and eventually also gets flown to safety with the rest of InGen’s workers. Admittedly the only snag in this line of reasoning is the location of the rex nest, which is not in the same location as Hammond’s thermal scans show back in his bedroom. However, this is one of the situations where film evidence begins to contradict itself. 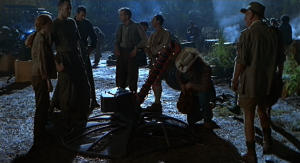 Factually, there is no way that Roland and Ajay could have made it to the rex nest from the game trail in the amount of time they had were that nest in the location that Hammond’s computer suggests; it was too late in the day for a trek of that length. Moving the game trail inland would not work to correct this imbalance as film evidence shows the game trail running along the coast. Thus, in the interest of creating a map that doesn’t involve random teleportation of the protagonists we decided that Hammond’s map is either not showing nesting sites, is blatantly wrong, or there is more than one rex family on Sorna. The latter is actually a fair assumption, since a viable population would have to include more than a single mated pair and their one offspring. 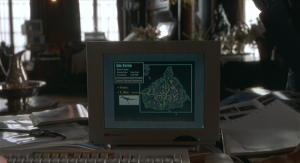 Hammond’s computer indicates rex territory somewhere in the middle of the island. Either this is simply a “current position” marker or another rex family’s territory, since Roland and Ajay could never have made it to this location before nightfall. Contradictions make the process difficult, though not impossible; not until Jurassic Park III anyway. Jurassic Park III is, to put it simply, a cluster of plot holes and contradictions. The most significant of these is the fact that Ben and Eric para sail into the island. Then Ben’s body is found (still attached to the para sailing harness and hanging from the tree he landed in) in the center of the island. 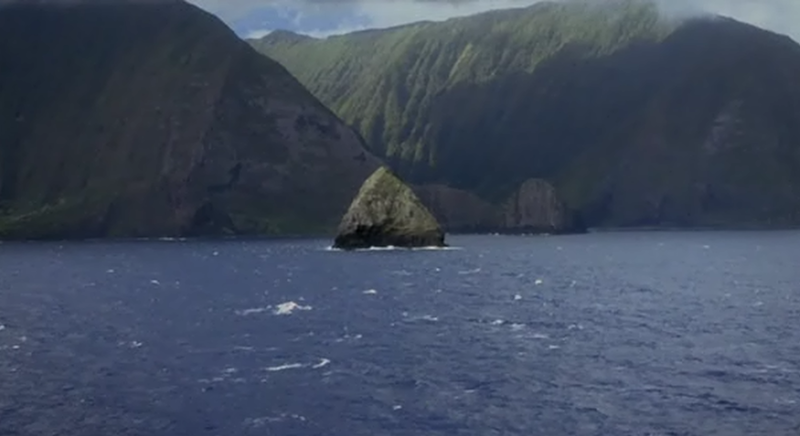 If anyone can explain how Ben was able to reach the center of the island from an initial gliding height of only a few hundred feet, well we would love to hear it. Then there’s the fact that (based on not only the actual location used for filming but also a quick shot in the film itself) the landing strip is actually less than a mile from the coast. 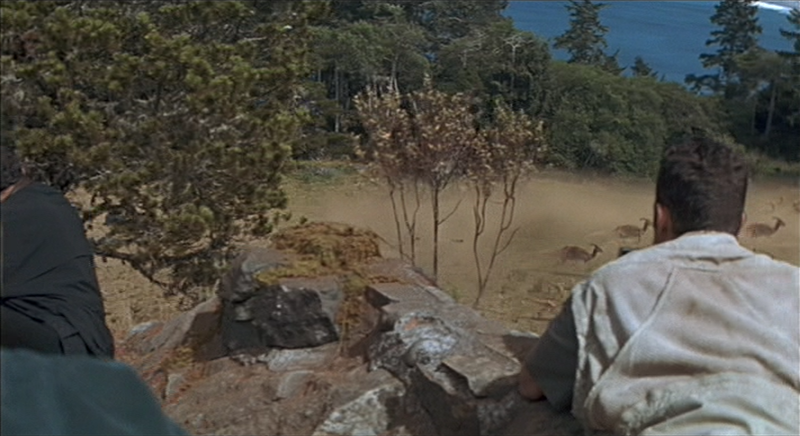 You know; the coast that Alan Grant was so intent on everyone getting to quickly? Yeah. They walked in the opposite direction of that coast. And of course in The Lost World: Jurassic Park we are told time and time again that the coast is relatively safe and devoid of carnivores, yet in Jurassic Park III Eric insists that “the closer you get to water the bigger things get.” Granted Brachiosaurus is both an herbivore and one of the largest things on the island, but by Eric’s tone he seems to be referring to dangerous carnivores. But nevertheless, some sort of map had to be drawn for the film, so we did our best to make a map that made sense. Unfortunately, this meant either taking out specific “in film evidence” (which we did not want to do) or breaking any sense of reality that the film tries to hold on to (which was an even worse proposition). Thus, on our map Ben and Eric para sail for approximately five miles before finally landing (perhaps they caught an updraft?) and the landing strip is not situated next to the coast (though we did attempt to put it near a water source, partly because a mile-long runway wouldn’t fit anywhere else). For its credit there are certain parts of the film, such as the location where the plane holding Alan and the Kirbys enters, which flow together well on the map. However these are few and far between. 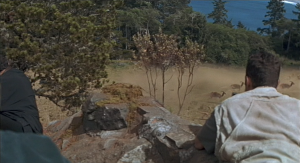 Some discrepancy exists in reference to the large rocks seen in the opening shot. Once believed to be either of the two large outcroppings seen on the map it was eventually realized that the rocks in the film are much smaller, on the order of a few pixels wide on the scale with which we were working. Because of this it was decided that the props crew likely wouldn’t have bothered to place these rocks on the map, since they are not large enough to represent a topographical feature. The film opens with the Dino-Soar boat on the western-side of the island, traveling around the coast clockwise. Eventually they release Ben and Eric on their para sail and travel into a fog. 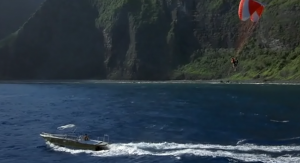 During this time the boat is attacked by an unseen animal, killing both captains and leaving Ben and Eric to crash into a small reef or outcropping. Hoping not to crash (which would send their para sail straight into the water) Ben unhooks Eric and himself from the boat and steers the para sail toward the nearest dry land; Isla Sorna. They slip between some mountains and begin heading inland, catching an updraft or two before finally crashing in a group of trees just a few hundred feet from a raptor nesting area (Velociraptor “antirrhopus sornaensis”). Eric is able to land relatively safely and turn off the camera just before the raptors attack, driving Eric away and killing Ben. Eric eventually makes home base a few miles away in an abandoned water truck. 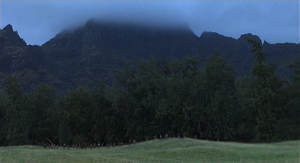 The rocks visible in the opening shot of Jurassic Park III. The Dino-Soar boat as it travels in a clockwise direction around the island. To the left is the same mountain behind which Ben and Eric later glide. Eight weeks later Paul and Amanda Kirby have come together to search for their son, lying to and kidnapping Dr. Alan Grant and his assistant Billy Brennan. 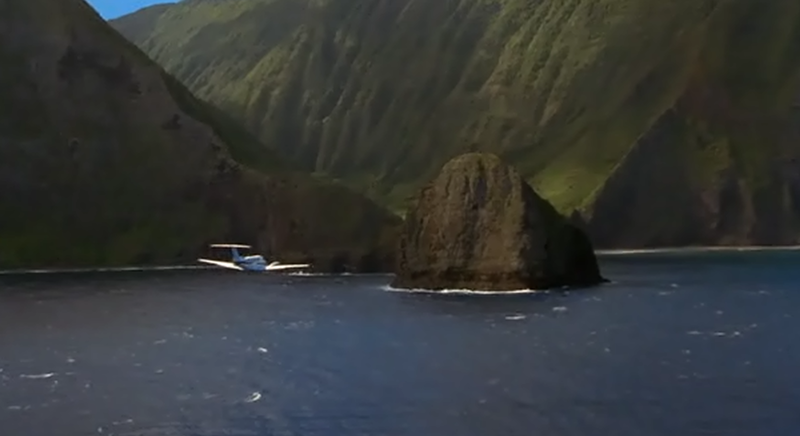 The plane they have chartered approaches Isla Sorna from the north. 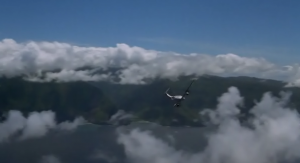 The path the plane takes would actually have taken them straight past the western coast; however the plane makes a sharp turn left (toward the east) and enters the island from the same location as the first shot of the film. The plane travels further inland until eventually turning left around a mountain and heading north above an open plain. Nash spots a landing strip ahead and to the left of the plane. 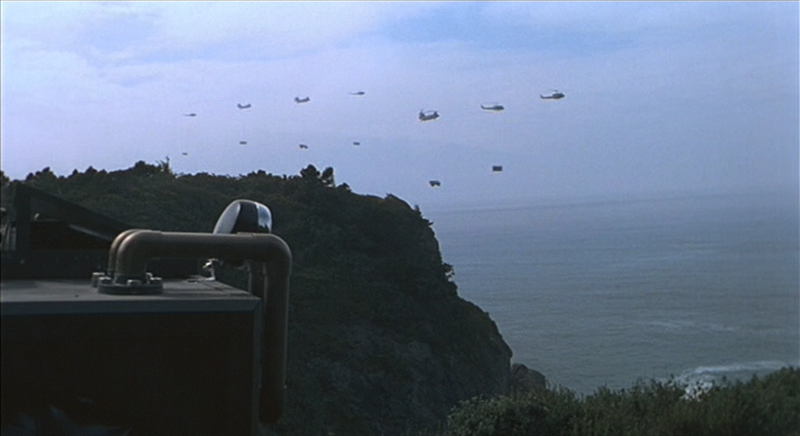 After Grant is knocked out by Cooper the plane circles the island before coming to land at Site B’s landing strip. The chartered plane as it turns left (to the east) toward the island’s western coast. 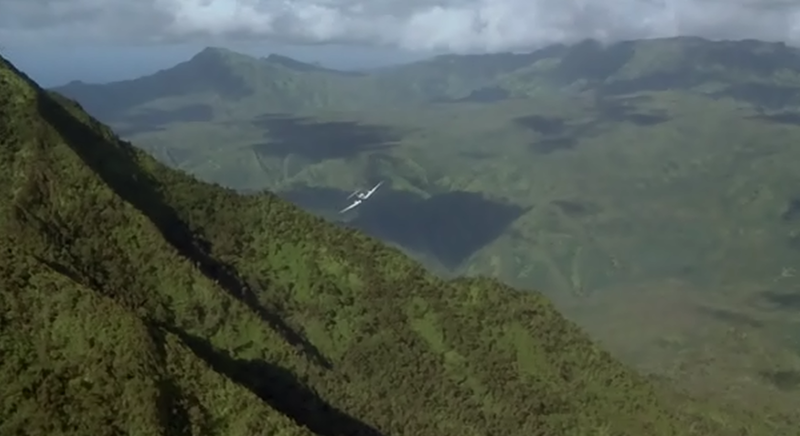 Note the valley directly to the plane’s left; this is where it enters (and the first shot of the island in the film). The plane as it turns left (toward the north) around a mountain side. After the Spinosaurus attack the plane is left crashed a couple hundred feet or more from the landing strip. Grant decides that the group must head for the coast to find rescue, leading the survivors southeast, away from the large Spinosaurus. After walking for a few miles they encounter the downed para sail and simultaneously discover Ben’s corpse and the nearby raptor nest. They leave the area quickly, continuing east, while Billy takes the time to steal eggs from the nest. The survivors stumble upon the para sail and thus the site of Ben’s death. The raptor nest is a short walking distance from here. Eventually they discover the Embryonics Administration building nestled in a valley below them and head into the building, entering through the main entrance from the northwest. After being attacked by the lone sornaensis male they exit the building from the same location turning south/southeastward, quickly stumbling upon a herd of Parasaurolophus and Corythosaurus. View from a higher elevation of the Embryonics Administration and Labs. The labs are confined to this valley, and based on this the survivors would approach the entrance from the left. 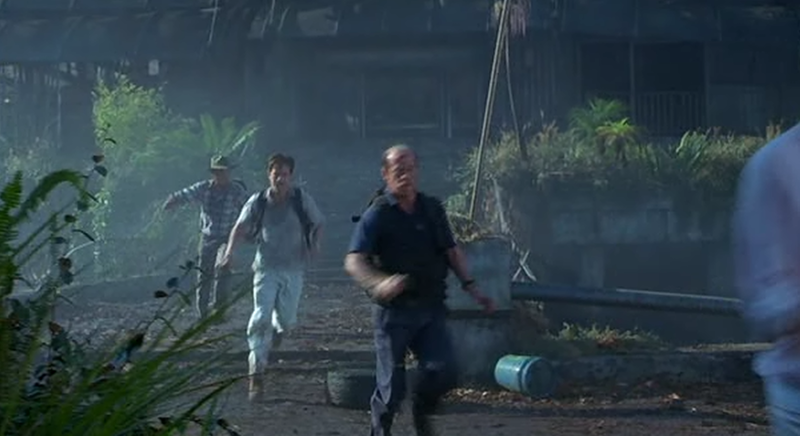 The survivors run from the Embryonics Administration building, exiting back out the front and turning left after exiting (the opposite direction from how they entered). In the confusion Alan is separated from the rest of the group and is found by Eric, who leads him back to the water truck where the two spend the night. Billy, Paul, and Amanda spend the night high in the trees. Come morning both groups set out. 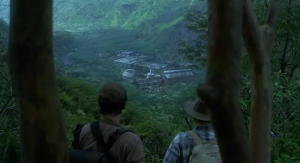 Alan and Eric eventually find the ravine, at the bottom of which is a river and a salvageable boat. The other group continues in the same general direction. Eventually both groups converge on either side of a perimeter fence, likely having passed on either side when the groups split up. After escaping the Spinosaurus again they head into the Aviary. Alan and Eric turning away from the canyon, below which is the river, the barge, and (out of frame to the far left) the Aviary. They escape the Aviary to the south, coming out next to the barge seen earlier by Alan and Eric, and travel south along the slow-moving river. Sometime during the next night they are attacked by the Spinosaurus a second time about a mile from the mouth of the river and spend the next few hours waiting for morning. They travel south toward the coast when they are ambushed by the raptors just out of sight of the beach (perhaps having been following the survivors on the water). Scared off by the approaching helicopters the raptors flee, leaving the survivors to quickly reach the beach and safety. They then traveled south in helicopters to rendezvous with a group of ships. How Billy was found (and is somehow not dead) is a matter of extreme plot armor; likely the armed forces in question spotted him floating in the water half-dead or washed up on shore near the mouth of the river. Billy probably floated “safely” on the river after passing under the Aviary walls, actually behind the barge on which Alan and the others were travelling. After the spino attack he would have drifted straight past the other survivors as they waited for morning, thus reaching the coast before them. So now the fandom has a map to follow. Again, most of these locations are approximations and may not be 100% accurate, but then neither are the films in what they are trying to tell us. Though we feel this is, in essence, “as close as we’re going to get,” I would personally like to take this opportunity to remind people that science is constantly evolving and being altered. If you think you have something to provide to the map (such as new information or a theory about some matter) do not hesitate to contact me (T-Rex_Master) on the forums through private message about it. I’ll be happy to look into it. 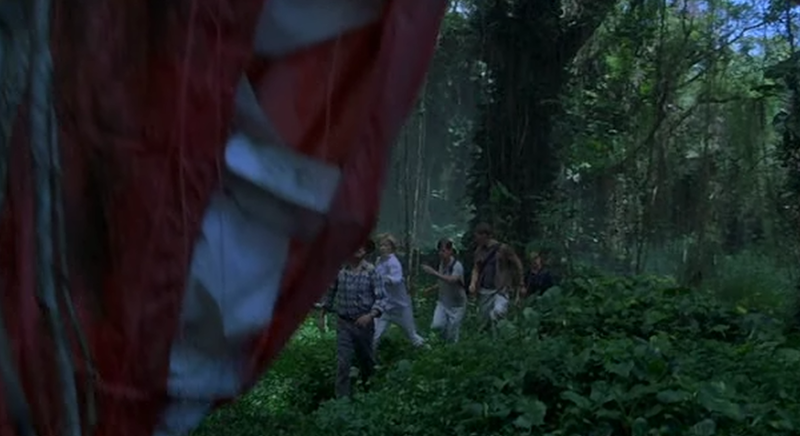 Hopefully Jurassic Park 4, whenever it happens, blends seamlessly into the rest of the map. We can only hope.